It is almost Christmas!! I am excited because today my son arrives and tomorrow my daughter arrives. We are so excited. Have a good bit on the 'to do' list, but wanted to write this post so I would be up to date on what I have been working on. 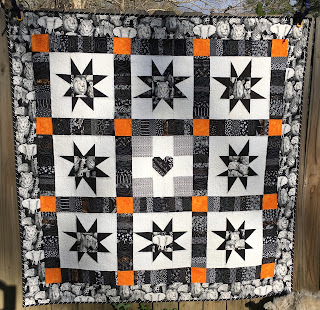 I have finished the Black and White plus one guild challenge from Mountain Quiltfest. 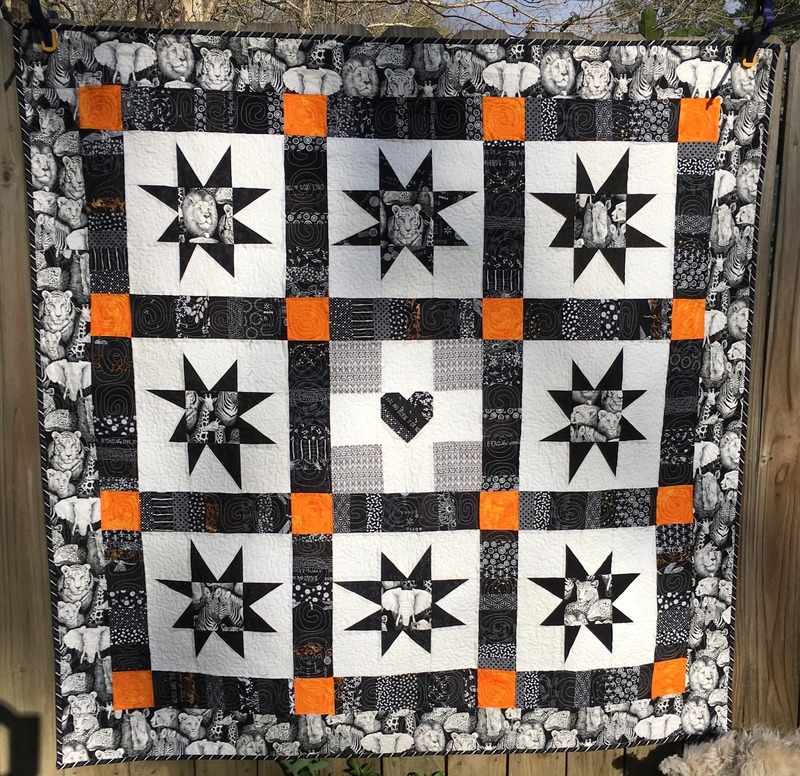 The challenge is to create a quilt with a perimeter less than 160 inches that is comprised of only black and white fabrics and one other fabric, I think I remember that the other fabric had to read as a solid. a max of 40 on each side. 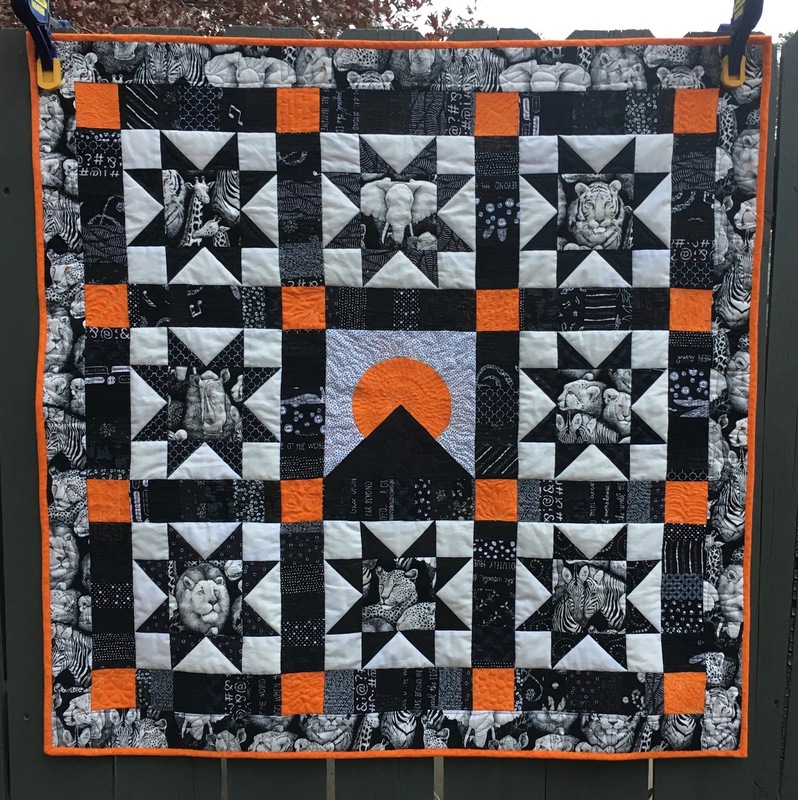 So I revised how I made the stars, shrunk the sashing and border....I was also not in love with the center square on Matt and Taylor's quilt. So I was talking to Will, my son, on the phone and asked what he thought. We were tossing ideas back and forth and he said something about a setting sun, and that made me think of the moon over a mountain block. 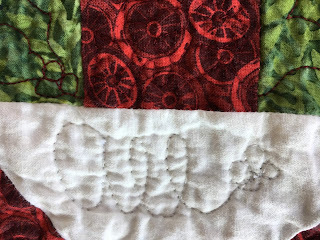 I took a free motion quilting class on craftsy.com by Leah Day, so I decided to do various quilting designs in each of the orange blocks. I was thinking, pick ones that are organic looking, that would remind people of nature. I did bamboo on this one. A vine with long fronds. 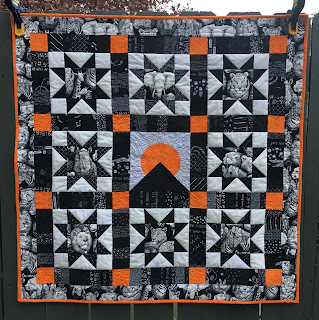 I also quilted each of the animal blocks and the mountain and the sun. 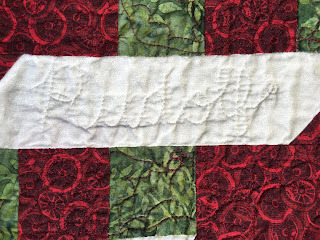 I decided not to quilt the white areas, so I just need to put on a label and a hanging sleeve. I hope each of you has an amazing Christmas and remembers that we celebrate this season because Christ died on the cross for our sins and this gift that God gave us is the ultimate gift of salvation and it is worth celebrating the birth of the Christ child. 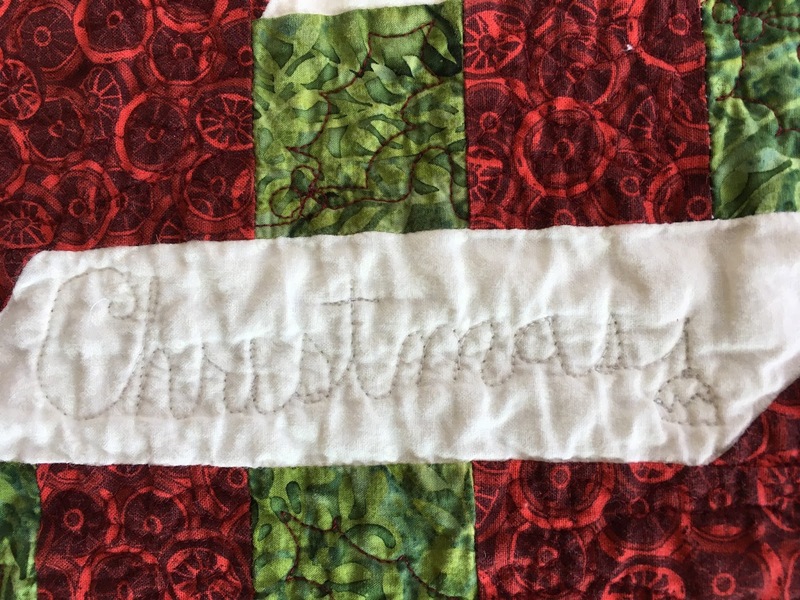 I don't know why I have had such a hard time keeping up with this blog this year...I really enjoy doing it. This post should have been written around Thanksgiving!!!! 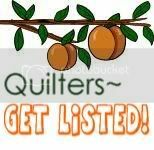 At the June Mississippi Quilting Association (MQA) they offer classes. I took the class with Jere' Funk. She sent fabric and cutting directions to do before you arrived to class. With the class only being one day long, you would not make enough progress if you didn't have the cutting done ahead. 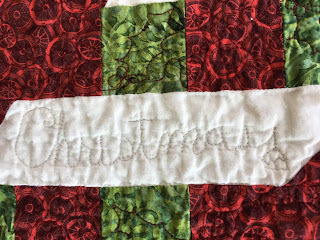 I decided I would like to have a Christmas throw and I had enough fabric in my stash to make the throw size without buying a thing!! At the class I got about 8 blocks made (out of 20). After I got home from the meeting, I was in full prepping for surgery mode as I was having replacement knee surgery in a month and in that time I also had a trip to Denver planned. So I made about 10 pots of soups and package and froze them in individual servings. I also trimmed all the shrubs, built some furniture and various other tasks to try to be ahead. So during the fall, I finally got the blocks back out and finished them. I only needed one seam to be done. My friend Lauren came over for a sew day and I got them sashed then. During the Thanksgiving holiday I rented my friend Lou Caffey's long arm and quilted it. 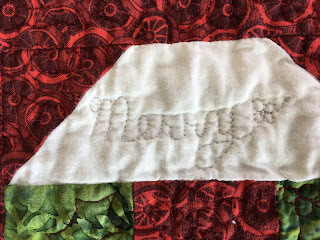 After I got it home, I quilted Christmas words in the white area. So it is done and hanging across the back of my love seat. I hope everyone has a very Merry Christmas and a Happy New Year.